John Frankovic - "Space Zombie"
Plasticland held the flag of psychedelia high throughout the 1980’s, more so than the Paisley Underground, a group of bands who tended to temper everything with an 80’s pop sheen. Instead, Plasticland belted out fuzzy, acid drenched pop tunes inspired equally by American garage rock bands and British loopsters like Syd Barrett’s Pink Floyd and The Pretty Things. Even though the members of Plasticland went their own ways at the end of the 1980’s, bassist and founding member John Frankovic continues to hold the freak flag high with his latest solo offering, Space Zombie. In a swirling mass of fuzzed out guitars, throbbing bass, backwards-tracked percussion, organ, space synths, and exotic instruments like sitar and electric bouzouki, Frankovic careens gleefully through eleven brain melting songs. From the high-energy buzz drone workout of Too Spread Out, to the Eastern trip of Here We Stand onwards, Frankovic soars through rainbow colored skies on a 60’s lo-fi pop voyage that is as melodically catchy as it is weird and freaky. Songs like the heavy rocker Play ‘n Hard, with its deliriously swooping harmony vocals; and the bouncy, candy-coated You’re Telling Me (love the bouzouki solo on this one!) conjure up the past with a refreshing peppermint snap in a cloud of patchouli incense. Frankovic doesn’t limit himself to strictly catchy pop-styled tunes though. For those who like their psychedelia a little more adventurous Go to Sleep is a 7 ½ minute trancy, Eastern tinged, mind-bending dronefest, Phalisti Revisited is a delicious instrumental stew of crunching rhythms, psychedelic noodlings and powerful bluesy guitar, and This Train Where? is a dazzling, miminalist electronic voyage full of weird and wonderful sounds that builds slowly over its 5-minute length into a very cool space rock trip. Although only eleven tracks are listed, the album ends with the particularly odd, percussive and sproingingly cartoonish untitled twelfth track, a real head scratcher that nonetheless left me with a big, if slightly askew smile on my face. This is a definite must-have for fans of Plasticland and anyone who loves that feverish, mind-altering 60’s sound. 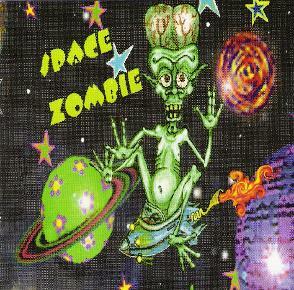 Trip the psych fantastic; it’s time to offer your brain up to the Space Zombie! For more information you can visit the Brainticket web site at: http://www.brainticket.com.